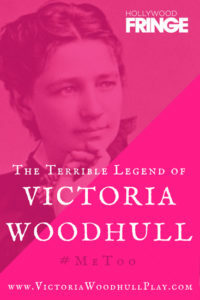 Most people today have never heard of Victoria Woodhull which is a shame. She lived a remarkable life, starting out with her younger sister Tennessee as traveling clairvoyants, telling fortunes and contacting spirits. Tennessee later became the favorite of millionaire Cornelius Vanderbilt. With his financial backing, the sisters became the first female stockbrokers on Wall Street. 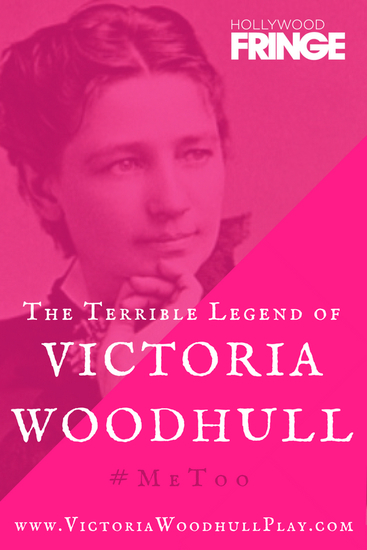 Woodhull was the first woman to address a congressional committee on female suffrage. She ran for President in 1872 even though she (or any other woman at the time) did not have the right to vote. She was later shunned by the suffragette movement because she was a proponent of free love, saying women had the right to escape bad marriages (as she did) and control their own bodies. A musical version of her life, Winner Take All was a flop when produced in 1976 at the Huntington Hartford Theatre in Hollywood. 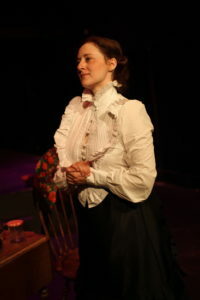 Now playwright Theo Saiter has written a one-woman show, The Terrible Legend of Victoria Woodhull, about this forgotten figure from our country’s history and it is being presented at the Hollywood Fringe Festival by The Owl & the Pussycat Theatre Co. I guess thinking modern audiences just couldn’t get right into Woodhull’s story, Saiter has concocted an opening scene where an actress uses the method technique to summon the spirit of Woodhull in a séance to tell her story. I think Woodhull and the actress, Ashley Ford, could make a go of it without the extra dressing. Ford easily evokes the spirited Woodhull and she channels other characters like her sister, husband and lover effortlessly. Karen Louisa Linton’s direction keeps the momentum going. It’s an interesting story that should be told, of a remarkable woman who was way ahead of her times.